Britain's Riding Clubs Endurance Championships have returned after seven years, as a result of the growing popularity of endurance as a competitive equestrian sport. The championships started in 1998 and, organised by experienced endurance rider and organisers, John and Jane Hudson, ran for 6 years at the popular Alfred's Tower ride. The competition was well supported by local riding clubs and attracted 18 to 20 teams, around 80 riders, mainly from the south west, but was stopped when the Alfred's Tower Ride ceased. Following their move to the West Country, John and Jane started a new ride to the east of Exmoor and decided to reinvent the riding clubs Championship. The new championship is being held in association with British Riding Clubs and all affiliated clubs are invited to enter a team of between three and six horses. Around 12 qualifiers will be held throughout the country with one or two events in each of the nine Sport England regions. The competition will comprise a 30-35km ride run under Endurance GB (EGB) rules and, depending on the number of entries, the top 2 or 3 teams will qualify for the Finals to be held at the Robin Hood Challenge on 4th - 5th September, one of the most prestigious endurance rides in the country with a racetrack finish at Southwell Racecourse. EGB are encouraging riding clubs to contact their nearest EGB regional representative for advice and coaching is available if required. "The Alfred's Tower ride was very popular with riding clubs in the area and we wanted to make that opportunity available again for Riding Club members. Endurance is a very social sport and provides a chance for riders to get access to country that they would not normally be able to ride across," says John. Maggie Smith, of British Riding Clubs, said there were now opportunities for Riding Clubs to be represented in equestrian sports across the disciplines, "and it is important that endurance is included. 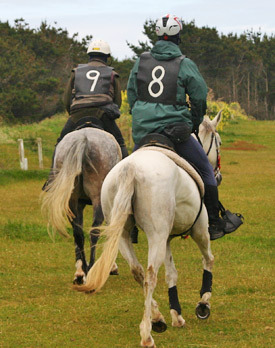 The Riding Clubs Endurance Championship provides an excellent opportunity for our members to get a taste of this discipline."